The Chomerics Division of Parker Hannifin Corporation, the global leader in motion and control technologies, today announced the introduction of a new single-component form-in-place EMI shielding gasket which provides valuable anti-corrosion and high-temperature characteristics for use in automotive, telecoms and military/aerospace applications. The new CHOFORM 5575 gasket is on display at the Parker Chomerics stand A2.432 at Electronica (Munich, Germany, 13-16 November 2018). CHOFORM 5575 features a quick-curing silicone resin with good flow properties, which means that it is easy to dispense on to small, complex part geometries in high-volume manufacturing settings. 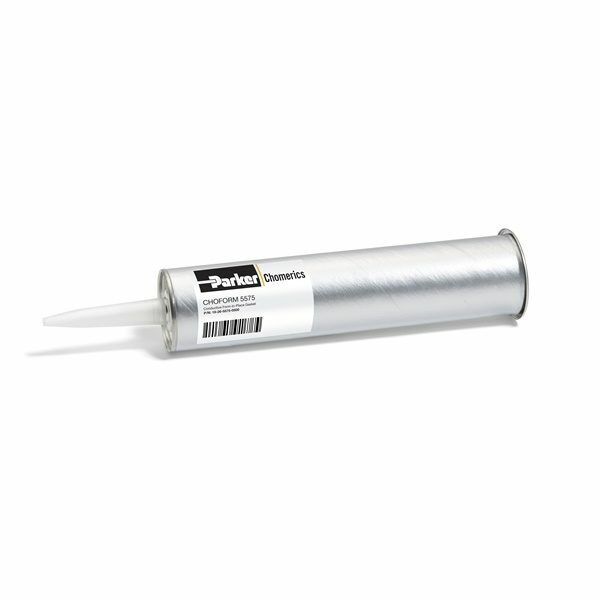 Its patented silver-plated aluminum filler technology provides exceptional galvanic corrosion resistance when mated to an aluminum substrate, making it ideal for use in aluminum castings or airframes. The filler’s high conductivity of 0.010 ohm-cm helps give this form-in-place gasket excellent shielding capability: noise attenuation is rated at 80 dB when tested according to a modified IEEE 299 standard method. The CHOFORM 5575 product is rated for use at ambient temperatures up to 125°C. The non-corrosive moisture-cure silicone resin gives a 4hr handling time, and fully cures in 24hr at 22°C and relative humidity of 50%. CHOFORM 5575 joins the extensive Parker Chomerics range of CHOFORM single-component form-in-place gaskets, which are easy to dispense and require no mixing or weighing. Because of the unique composition of the silver-plated aluminum filler in CHOFORM 5575, designers of systems based on an aluminum substrate can have very high confidence in the product’s resistance to galvanic corrosion, and therefore in its long-term high performance and reliability. Visitors to the Parker Chomerics stand will also be able to see Chomerics’ PREMIERTM PBT-225, an electrically conductive plastic which can be used to form robust and weight-saving electronics enclosures. PREMIERTM PBT-225 is growing in popularity as a replacement for aluminum or steel housings in automotive applications, as it is substantially lighter, while offering excellent hydrolysis resistance and a good level of shielding over a broad frequency range. The Parker Chomerics stand A2.432 will also feature the CHO-TOUCH™ touchscreen LCD displays. These integrated assemblies consist of a touchscreen, optical bonding and a high-performance display, and are ready out-of-the-box for use in harsh-environment applications in the military, avionics, medical and industrial sectors. Parker Chomerics will also be displaying the THERM-A-GAP™ high-performance dispensable gels. Like the CHOFORM 5575 product, THERM-A-GAP gels are ideal for use in high-volume manufacturing plants. They offer thermal conductivity of up to 5.0W/m-K, providing an excellent thermal interface between electronics components such as processors, MOSFETs and IGBTs and a heat sink or heat spreader. Parker Chomerics Division is part of the Parker Hannifin Corporation Engineered Materials Group and is a global leader in development and application of electrically and thermally conductive materials in electronics, transportation and alternative energy systems. Chomerics is the first choice in EMI shielding and thermal management solutions for telecommunications, information technology, medical devices, automotive, military, commercial and consumer electronics industries. For details, visit www.parker.com/chomerics.